Honesty is the vein that runs through the life and art of Dan Gerhartz. This integrity, combined with his driving work ethic and impeccable technique, have brought him a degree of success that artists twice his age would envy. Born in 1965, Gerhartz grew up in rural Wisconsin, an area he continues to call home. The unspoiled beauty of the nearby Kettle Moraine State Forest was his playground as a child and provides inspiration for many of his paintings today. "I've been really lucky," he says. "I can paint what I want to paint. The area around here is so beautiful, with its rolling hills, deciduous forests, and prairies. I love to place a figure against that landscape." 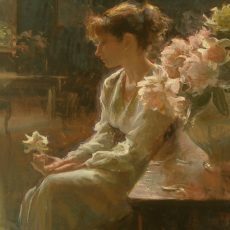 Gerhartz credits an inspirational high school art instructor, John Baitinger, for helping shape his artistic direction. "He guided me through my formative years when I didn't know where I wanted to go with my art. But I already knew it was going to be a very important part of my life." He continued his studies at the American Academy of Art in Chicago, where he was awarded the Faculty Recommendation Scholarship and the President's Award in 1985. 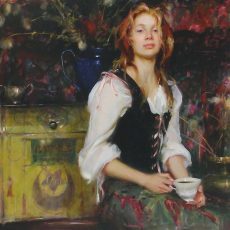 Later, artist Richard Schmidt was important in Gerhartz' career through sharing his knowledge and skill. Despite his remarkable early success, Dan Gerhartz is determined to keep growing. "This is just the beginning," he says. "All I have to do is open a book with the work of the masters. Their technical ability is just so humbling. Painting is a never-ending learning process. I look forward to learning my entire life." To this end, he spends a great deal of time studying the work of artists who inspire him, including John Singer Sargent, Alphonse Mucha, and the French and American Impressionists. Particularly important have been Russian artists, especially Nicolai Fechin. "The Russians are so loose, but so honest," he explains.